Criminal Trial Of Insys Therapeutics' Executives Concludes The 10-week trial of five executives from Insys Therapeutics wrapped up in Boston on Friday. The executives are accused of bribing doctors and deceiving insurance companies to boost opioid sales. 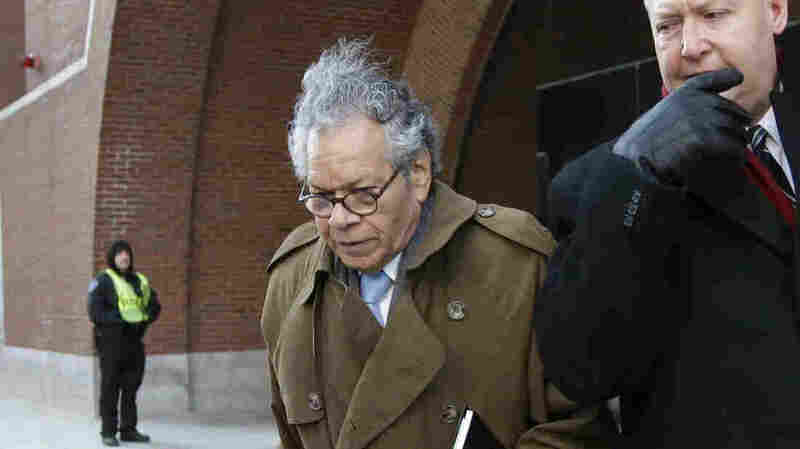 Closing arguments are done and the criminal trial of pharmaceutical executive John Kapoor is now in the hands of the jury. Deliberations begin on Monday. The federal government has accused Kapoor and his four co-defendants of bribing doctors and deceiving insurance companies. In bringing criminal charges against corporate executives, the federal government is widely seen as trying to demonstrate that it is acting aggressively against drug companies and the role they allegedly played in the opioid epidemic. During the trial, federal prosecutors depicted the onetime billionaire as a man driven by greed. During closing arguments, Assistant U.S. Attorney Nathaniel Yeager told jurors in Boston's Moakley Federal Courthouse that Kapoor put patients' lives at risk to ensure his own financial success. Kapoor, the founder of Insys Therapeutics, allegedly oversaw a marketing strategy that paid doctors more than $1 million to prescribe Subsys in high doses — often to patients who did not need it. Subsys is a highly addictive opioid painkiller up to 100 times stronger than morphine. Then, prosecutors claim, Insys set up a call center to ensure the expensive medication was covered by insurers. At the call centers, Insys employees allegedly pretended to be from doctors' offices and fabricated diagnoses and other information necessary to get the medication approved. "The decisions, the money, the strategy came from the top," Yeager said. The obligation of physicians to "first, do no harm, became: First, do what you're told." Yeager showed the jury internal company spreadsheets detailing how much money Insys had paid each doctor and the ROI, or return on investment, from those payments. That is, exactly how much money the company was making back via prescriptions from each doctor it had paid. Yeager suggested it should be called ROB — "return on bribe." After nine weeks of testimony from the government witnesses, the defense rested its case in less than three days. "The story cannot be true, and they don't care because they have had their eye on this man," Kapoor's attorney Beth Wilkinson told jurors in her closing arguments, gesturing toward Kapoor. "They want to show that they can take down the guy at the top." Wilkinson argued that Kapoor was motivated by two things: First, Kapoor vowed to do something after watching his late wife suffer in severe pain while dying of cancer. Second, Kapoor believed in the medication and thought it worked better and faster than comparable painkillers. That's why, his attorneys asserted, Kapoor kept his stock in the company and stepped in as CEO when Insys Therapeutics was struggling. As for the alleged illegal activity, Wilkinson laid the blame on former Insys executives who have flipped, pleading guilty and testifying for the prosecution. She said they orchestrated the schemes, unbeknownst to Kapoor. Pill mills, for us, meant dollars. Wilkinson argued the government's star witnesses were not to be trusted. Not only had they overseen the illegal schemes — thus, they had a track record of lying — but they also had an incentive to lie and blame Kapoor because they want more lenient sentences, she said. Wilkinson spent much of her closing arguments detailing inconsistencies between the government's witnesses. One of the main government witnesses in the trial was Alec Burlakoff, the former vice president of sales at Insys. On the witness stand last month, Burlakoff admitted to bribing doctors and testified to purposefully targeting unscrupulous doctors known for liberally prescribing opioids. "Pill mills, for us, meant dollars," Burlakoff said. "It was not run the other way. It was run to the pill mills." He appeared briefly in a music video Insys sales reps made about getting patients on the highest dose possible. Burlakoff testified that he had discussed the bribery strategy with Kapoor and was only following his guidance. But both federal prosecutors and defense attorneys agree that Burlakoff repeatedly lied to investigators and possibly in his testimony. Prosecutors argued that Burlakoff's behavior was further evidence against Kapoor. "Would you hire him as your VP of sales?" Yeager asked the jurors during his closing arguments. "You saw him. Would you put him in charge of a sales strategy?" Kapoor's attorneys argued this same behavior demonstrated that the government's case was weak. "Why else would you cut a deal with that guy? They didn't have enough evidence otherwise," Wilkinson said. "[Burlakoff] was the one. Every road — of bad conduct, of bad action — leads back to him." After 10 weeks of testimony, dozens of witnesses, and thousands of documents of evidence, the trial of Kapoor and his co-defendants has been turned over to the jury.